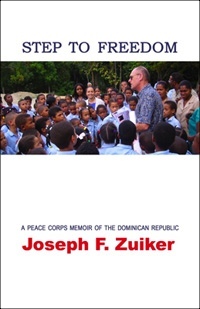 In 1965, 24-year-old Joseph Zuiker joined the U.S. Peace Corps, which sent him to a small town in the Dominican Republic. Eager to make a difference in this poor country, he hurried to integrate himself into the community of Santiago de la Cruz. After overcoming his beginner's Spanish, dysentery and suspicion that he was a Yankee spy, he hit his stride and found a purpose to his service. Step to Freedom is the tale of the two years Zuiker spent in the Crossroads. His tale of travails and triumphs is a story common to Peace Corps Volunteers, but also a unique chronicle of his determination to find and fulfill a mission—to get a school built. Written in 1968 and finally published in 2005, Step to Freedom is the product of a collaboration among three generations of Zuiker men: Joseph lived the experience; his father, Francis, chronicled it; and his eldest son, Anton, wrote the foreword and published the book. Purchase Step to Freedom at Lulu.com or CafePress.com. Read the Foreword by Anton Zuiker here. See pictures of Joseph's service and his 2004 return visit to the DR here.